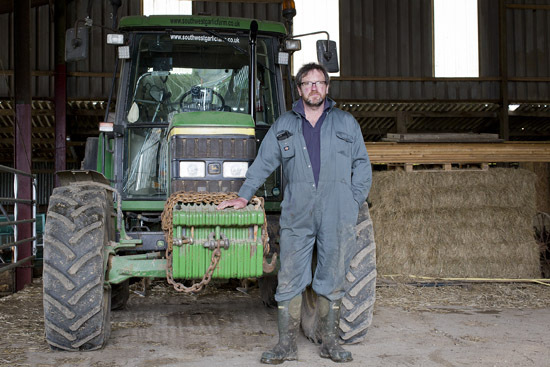 "I found my true self doing this," says Mark Botwright, a.k.a. 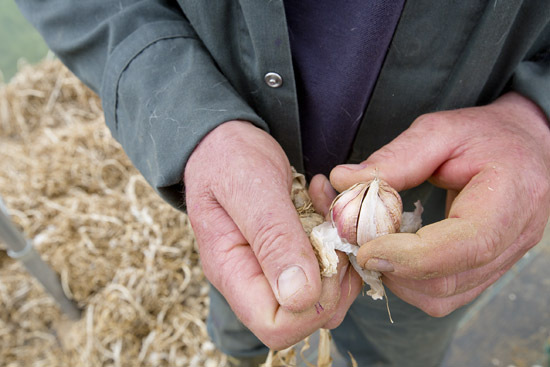 'The Garlic Farmer', at this remote hillside farm in Dorset. "It's exactly where I should be in life – I'm just happy." A decade ago, no one could have predicted how dramatically his life would change. Back then, Mark was a sheep farmer horribly affected (but not infected) by the aftershocks of foot and mouth. His wife Wendy had given him two precious cloves of Elephant garlic as a present, which he grew for fun – resulting in bulbs the size of grapefruit. 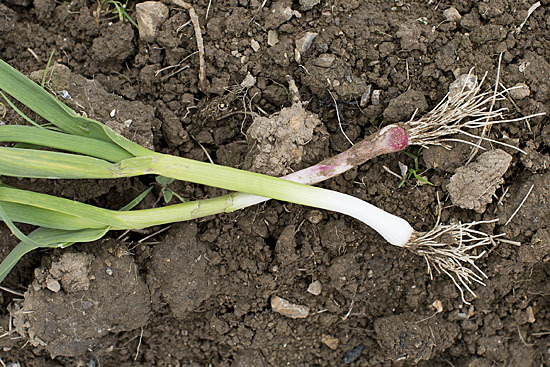 The picture below shows a plant a month or so before harvest alongside a normal garlic plant at the same stage. 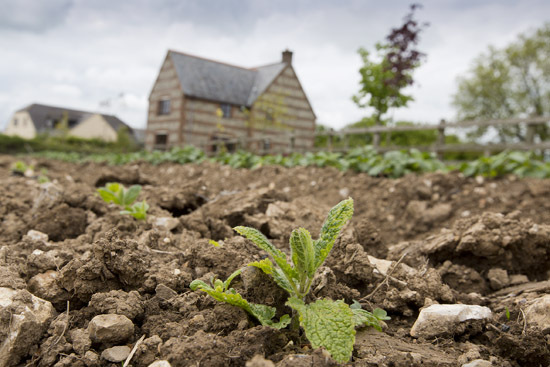 For seven years, Mark refused to eat the crop and replanted the cloves every year to multiply up his stocks. The family moved house, digging up lawns and vegetable beds to find space for his obsession. 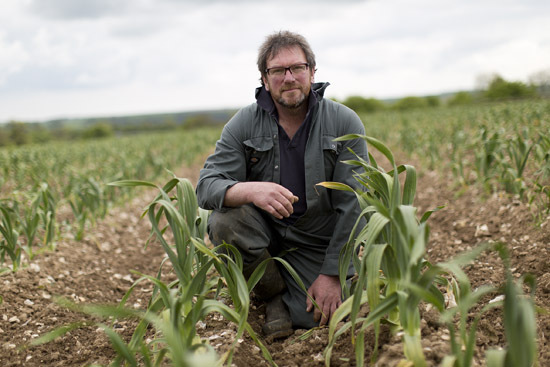 Now Mark is on track to be the biggest Elephant garlic farmer in Europe in three years time, with a million bulbs in the ground. 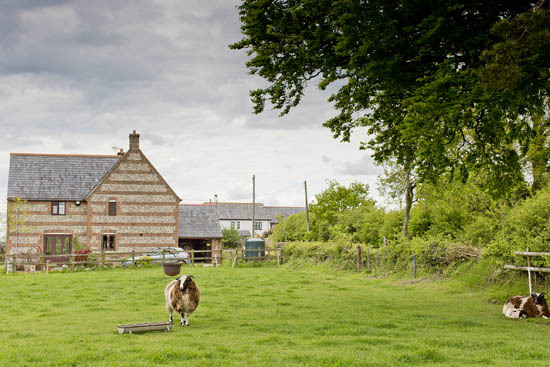 The South West Garlic farm is run by Mark, his wife Wendy and son Jack, who live on their new farm of 65 acres. After harvest around the end of June, they sell fresh and dried Elephant garlic alongside a range of other niche products. Garlic scapes are a bestseller. These are the shoots of the garlic harvested a few weeks before the bulbs themselves. 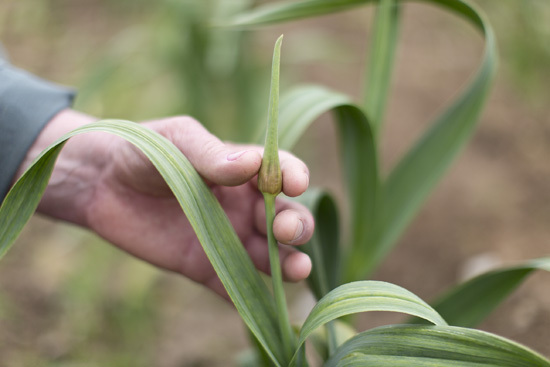 Below is an Elephant garlic scape that has just emerged and will be harvested at around 12" in length. 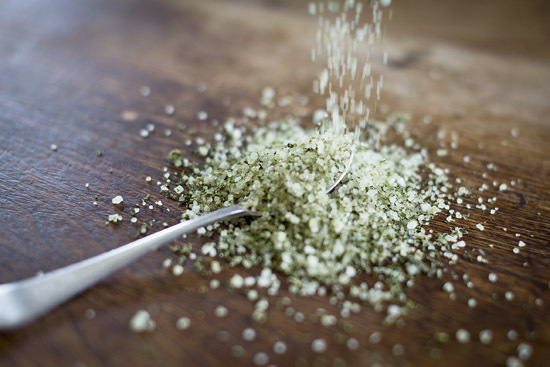 Chefs such as Mark Hix and Yotam Ottolenghi are big fans. 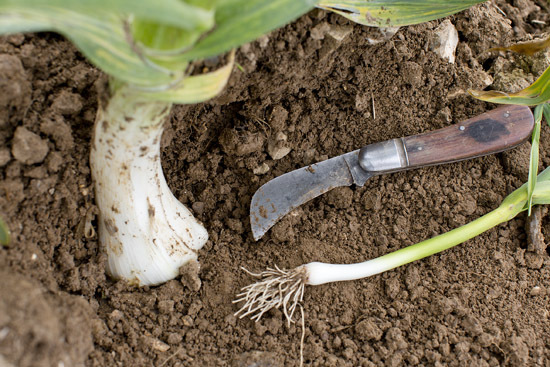 Mark also grows Morado and Iberian hardneck garlics, both for their bulbs and their scapes. 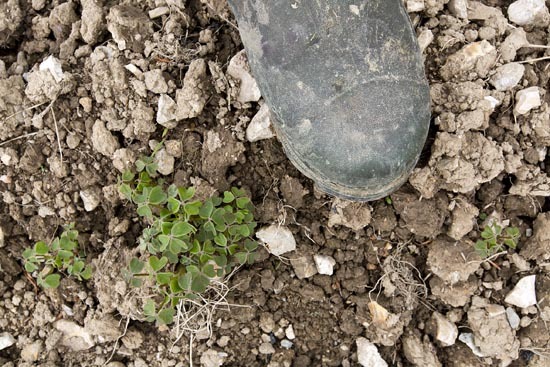 Future plans include selling the hardneck plants when immature, as in the picture below. 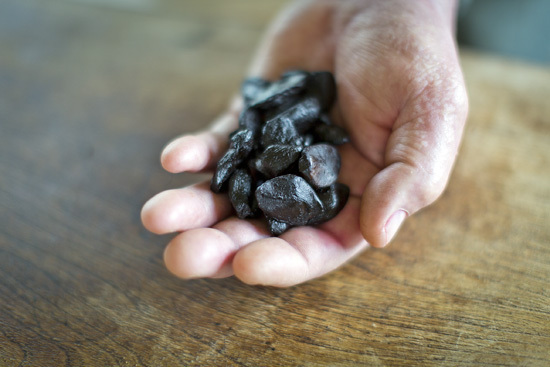 Black garlic is another specialty. This is based on an ancient Korean method of preserving the garlic and involves slow cooking the bulbs for 45-50 days. 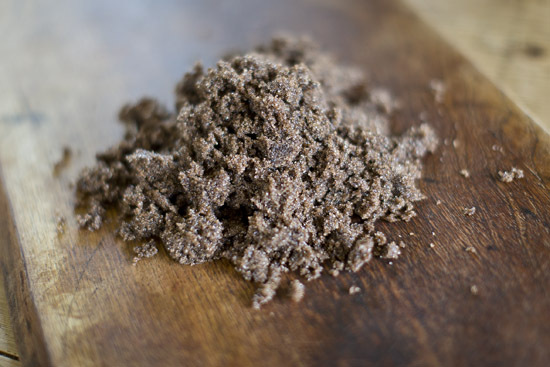 Other products include black garlic sugar, black garlic salt and wild garlic salt, which they sell online. Always willing to try new things, he also has crops of Chinese artichokes and yams (pictured below) in the ground. 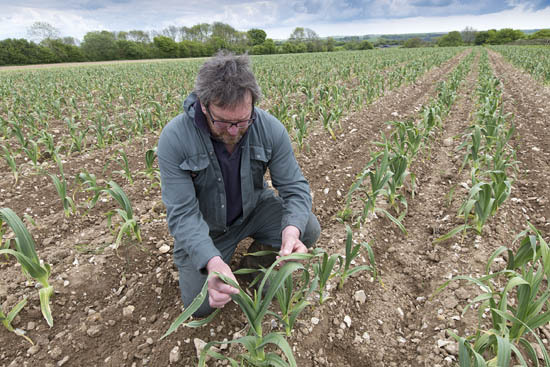 Social media has been the key to the success of the the South West Garlic Company. 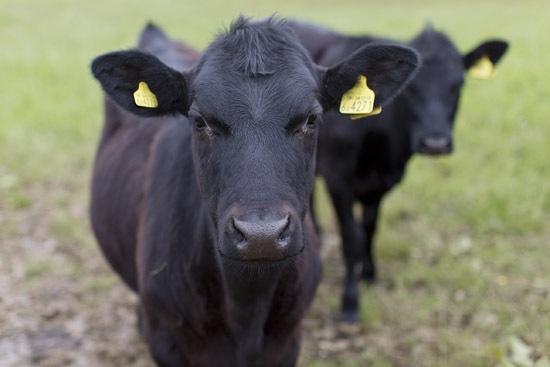 "We wouldn't be here without it," Mark says, as we meet the family's new cattle. From his remote location Wendy and Mark can communicate directly with chefs, deli owners and grocers. They deal with wholesalers, too, and over the years have worked on and off with several in the Market on a non-exclusive basis. 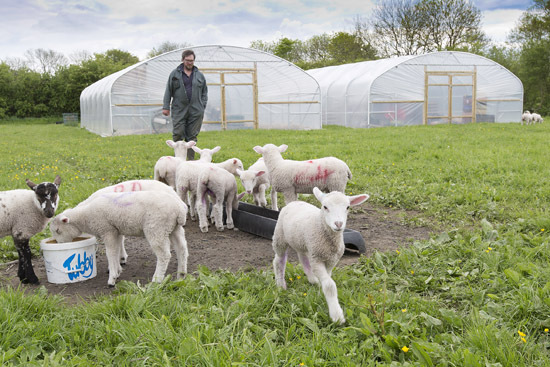 "From being a sheep farmer to garlic farmer has been a long and very enjoyable journey," Mark says. 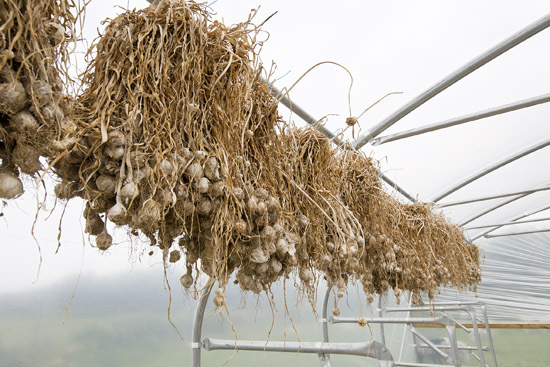 "In three years time we will be holding the biggest stock of Elephant garlic in Europe." Since this blog was first posted, First Choice have started stocking the full range of products from South West Garlic Farm.